Carpenter ants are one of the largest ant species in North America. Adults can be up to a half-inch long, and queens may grow up to a full inch in length. While most carpenter ants are black, they may also be yellow, red, or a combination of these colors. Their bodies are segmented and oval; they have one-node waists, antennae, and six legs. Read on to learn more about this invasive ant species. Carpenter ants are known to bite, and workers’ mandibles are strong enough to puncture the skin. 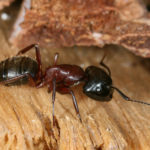 However, bites typically only occur when the carpenter ants’ nesting area is disturbed, or when there’s a particularly large infestation. Like other species, carpenter ants often create a colony outside and enter homes in a search for water and food sources. Once they’re in the home, carpenter ants are drawn to moist wood, but they sometimes invade dry wood as well. Worker ants use their mandibles to create galleries and tunnels in wooden structures. There may be multiple satellite colonies apart from the main colony, and if an infestation is not treated promptly, the damage to the home’s wooden parts may become extensive and costly to repair. These ants leave behind several signs of infestation, such as those listed below. Termites and carpenter ants are often confused with each other because they behave similarly by infesting structural wood. However, they invade for different reasons. 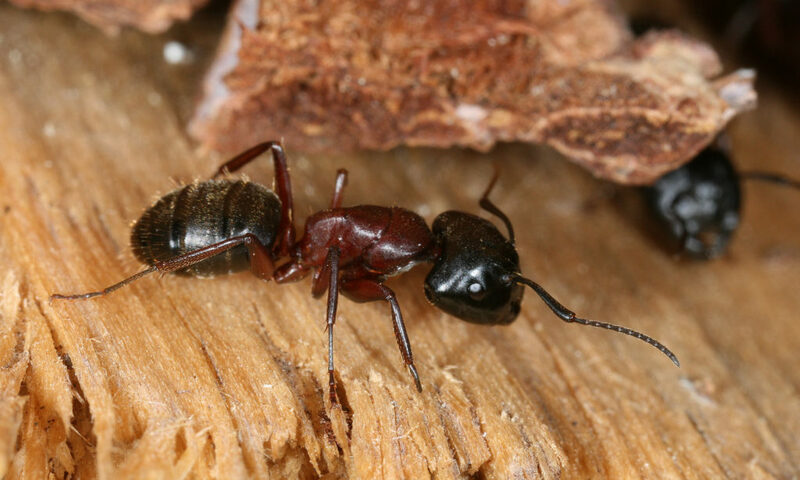 While termites actually consume the wood, carpenter ants don’t; they only tunnel in to build their nests. And while their appearance is also similar, there are several noticeable difference between the two as shown by the drawings below. Termites aren’t as big as carpenter ants. Color and appearance. Termites are soft-bodied and white, while carpenter ants are usually black, red, yellow, or a combination thereof. Carpenter ants have pinched waists, while termites’ waists are broader. Termites’ antennae are straight while carpenter ants’ are bent. Winged carpenter ants have large front wings and small back wings, while both pairs of termites’ wings are the same size. Carpenter ants are frequently seen outside their nests as they look for water and food, while termites are seldom seen outside their nests and tunnels. It can be quite difficult to get rid of carpenter ants because they often build multiple nests throughout the home. 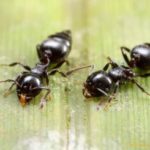 The easiest and most effective way to end an infestation of carpenter ants is to seek advice and assistance from a local pest control company. By finding a provider with the experience, knowledge, and equipment to exterminate these ants, homeowners can stop infestations and prevent new ones from occurring in the future.